As noted in the first blog of this series, the National Marine Fisheries Service (NMFS) is responsible under the Endangered Species Act for protecting the endangered Winter Run Chinook salmon of the Sacramento River. But when the US Bureau of Reclamation (USBR or Bureau) and the Department of Water Resources (DWR) have asked NMFS to comment on proposed changes in Central Valley Project operations during the present four-year drought, NMFS has consistently concurred, often going against its own previous prescriptions and advice. As a consequence, the Winter Run salmon were put at great risk, decimating the 2014 and 2015 year classes and again placing the population at the brink of extinction. The critical phrase here is “nondiscretionary obligations.” It is the view of NMFS, as described in its Biological Opinion for the Operation of the State Water Project and Central Valley Project, that the Bureau of Reclamation does not have the discretion to release less water to Sacramento River Settlement Contractors than 75% of contracted amounts. Thus, low April and May flows called for in the 2014 Drought Operations Plan were overwhelmed by calls for water by the Settlement Contractors. “Winter-run Chinook salmon viability and Sacramento Settlement Contractor deliveries: Reclamation is working with Sacramento River Settlement Contractors on options to shift a significant portion of their diversions this year out of the April and May period and into the time frame where Keswick releases are higher to achieve temperature objectives on the upper Sacramento River. The willingness and cooperation of the settlement contractors in this effort would allow a modified diversion pattern and create the benefit of increased Shasta Reservoir storage at the beginning of the temperature control operations and increased availability of water to these senior water rights holders in this critically-dry year. 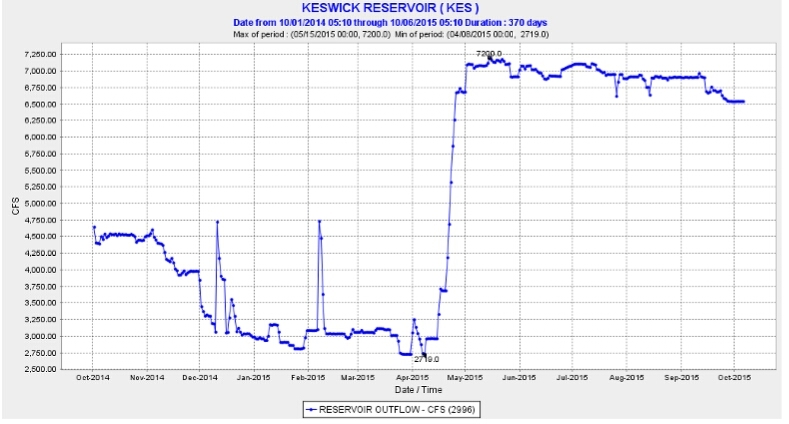 This deferral of irrigation would allow implementation closer to the lower range of the Keswick release schedule for April and May, as identified in Section V of the DOP (Drought Operations Plan). Thus the agencies and the Settlement Contractors were left to work out on a voluntary basis a mechanism to keep enough cold water in Lake Shasta to protect Winter Run salmon throughout the summer and fall. The State Water Board approved the Plan. It didn’t work. Though releases from Shasta in April, 2014 were low, the Bureau ramped up releases from Shasta to the Settlement Contractors in early May (Figures 1 and 2), and cold water in Lake Shasta was depleted by the end of August. Figure 2. 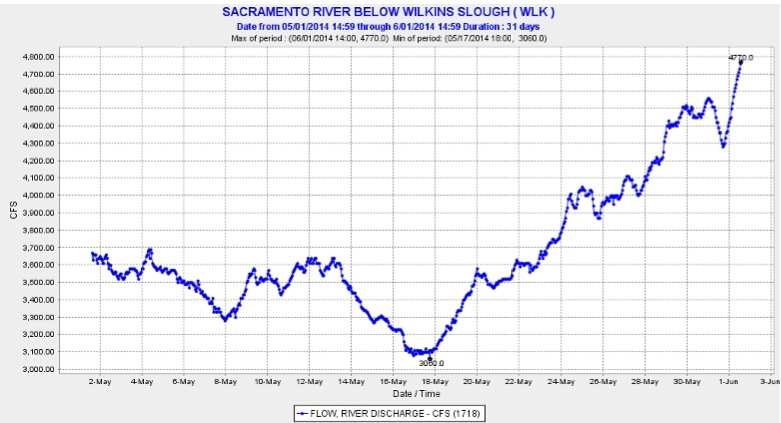 May 2014 releases from Keswick to the Sacramento River were diverted by Settlement Contractors upstream of the Delta. 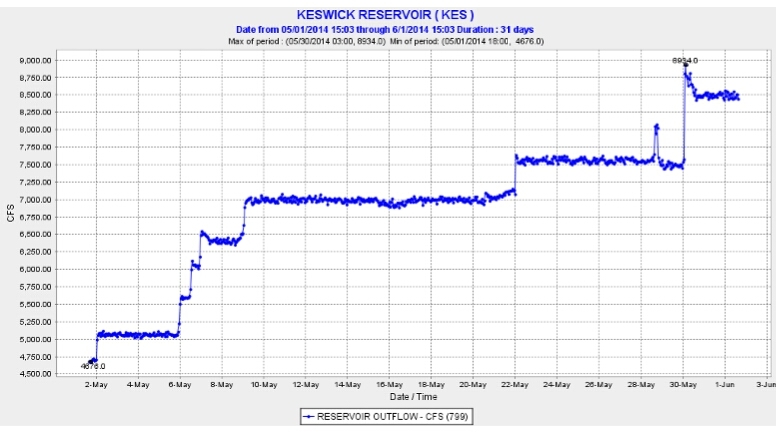 Contrast flow at Wilkins Slough (~25 miles north of Woodland) with releases from Keswick in Figure 1: most flow increases over the month were diverted north of the Delta. Temperature management is critical. Salmon rely on cold water, particularly during early life stages when fish are young and vulnerable. Shasta and Keswick dams block endangered winter-run Chinook from accessing their native cold water habitat in the Upper Sacramento and McCloud Rivers, so their eggs and fry are particularly vulnerable to high summer temperatures. Data from the Sacramento River indicate 2014 temperatures were at levels that impact the survival of juvenile salmon and steelhead. We found that the 2014 temperature criterion was exceeded starting in August, resulting in approximately 95% mortality of eggs and fry upstream of Red Bluff Diversion Dam. As of December 16, 2014, an estimated 390,000 juvenile winter-run Chinook salmon passed Red Bluff, compared to 1.8 million in the previous brood year and 850,000 in brood year 2011, the year of the winter-run collapse (see Nov. 18 USFWS/CDFW/NOAA Fisheries presentation to State Water Board). This is the fewest winter-run Chinook juveniles per female spawner passing Red Bluff in 11 years. Reclamation has provided an assessment of additional technological or operational measures that can increase the ability to manage the cold water pool. Reclamation notified the State Board, through filing the TUC Petition, that meeting the biological needs of winter-run and the needs of resident species in the Delta, delivery of water to nondiscretionary Sacramento Settlement Contractors, and Delta outflow requirements per D-1641 , may be in conflict in the coming season. In conclusion, NMFS concurs that Reclamation’s Project Description is consistent with Action I.2.3.C and meets the specified criteria for a contingency plan. … Furthermore, the best available scientific and commercial data indicate that implementation of the interim contingency plan will not exceed levels of take anticipated for implementation of the RPA specified in the CVP/SWP Opinion. And once again in 2015, no one stepped up to maintain cold water in Shasta Reservoir in April and May (Figure 3). Figure 3. In 2015, releases to the Settlement Contractors ramped up in April and were high throughout May. By July 1, 2015, NMFS was already issuing a post-mortem. We should expect more from the federal agency mandated to protect our endangered salmon. At a minimum, NMFS should have not concurred, in 2015 (or in 2014, for that matter), and should have called out the fact that added take of Winter Run would occur, further jeopardizing the viability of the species through direct mortality and degradation of their critical habitat.